I’ve said, and pretty much everyone agrees, that Barack Obama will not be there. However, I’m still trying to get a comprehensive list of everybody else subpoenaed by Orly Taitz who will also not be there. The following list is not official. There are rumors that Butterdezillion and Ron Polland were subpoenaed, but won’t show up. I hope that’s not true because I would LOVE to see a transcript of Birthers under oath. Now I gotta call JimBot and let him know that the busses to take the 100 Obots from the airport to the hearing need to plan a new route. PS: Notice that WorldNetDaily has been awfully silent about following up their story that Jimbot is really Fannie Mae Chairman James Johnson. I don’t blame them. It was a stupid story. I’ve seen the DHHS response. They’re obviously not showing up because federal officials can’t be served with a state subpoena. Fuddy obviously isn’t showing up either. As Dept Attorney General Nagimine said, “Hawaii isn’t Georgia”. As for the Atlanta CBS affiliate, exactly what would their news director know about a national program? If there’s anything that wasn’t shown, doesn’t Georgia have reporters’ shield laws? It sounds to me as if he was picked only because he had a Georgia address. While I can understand the sentiment and would definitely relish seeing some of the Birthers have to testify under oath, I think we both understand that it won’t happen – at least not in this situation. In terms of the actual context and purpose of this hearing, none of the Birthers that Orly wants to testify have anything relevant to add or testify about. It is one thing for any judge to entertain letting these Birther litigants prattle on to some extent as they flounder about to try to make their case… but to entertain allowing them to call witnesses to the stand would just be a wasted exercise down an irrelevant side-tangent rabbit hole. I can’t see any judge being that loose or irresponsible in keeping the case before him focused on only dealing with actual matters at hand. Whether any of those folks show up as a result of Orly’s invite or “subpoena” of them… or even merely out of their own interest, it won’t result in any of them actually testifying. They’ll merely get to be part of the audience in the room; that is all. Whether any of those folks show up as a result of Orly’s invite or “subpoena” of them… or even merely out of their own interest, it won’t result in any of them actually testifying.They’ll merely get to be part of the audience in the room; that is all. This has been so interesting just seeing how creative Orly can be with subpoenas and how much law she can either twist or get totally wrong. I was looking at her emergency request for letters rogatory to Judge Malihi to get Fuddy to show up at the hearing and bring the original BC and microfiche copy containing it. I’m wondering if that was when he realized that Orly was complete off her rocker, given A) that he didn’t have the power to do that (only a superior court judge could do that) B) she got the code section wrong, C) that it only applied to depositions, and D) that she left out the part of the Georgia Code that stated that letters rogatory were only to be issued for requests made to foreign countries. I’m wondering if Fuddy might just say to heck with this and just show up on her own (sans the requested materials of course). I’d be surprised if the judge would compel her to answer anything that is confidential and protected by Hawaii state law. I’d just like to see her on the stand telling about how many countless hours her office and the Attorney General’s office has wasted on Orly and other assorted birthers. 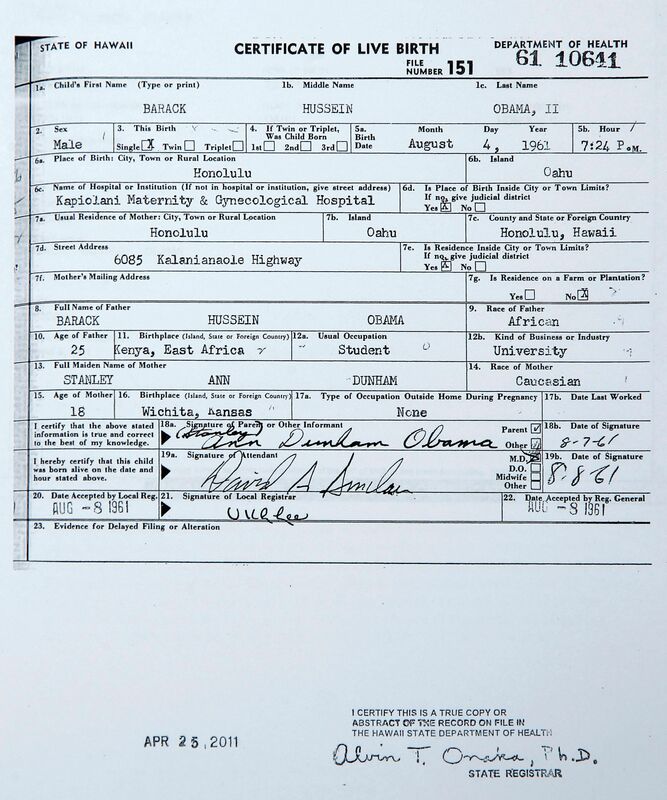 I wouldn’t mind seeing her on the stand just reiterating what we already know, which is that a bound copy exists with Obama’s original certificate, that she witnessed seeing the copies made, and that she fully believes that Obama was born in Hawaii. Of course they’re never going to part with the bound volumes. The specifically wouldn’t allow Duncan Sunahara to receive anything other than his sister’s short form even though he specifically asked for a long form and even asked to be present to see the copy made. 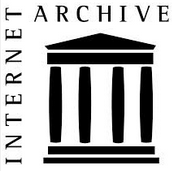 They specifically noted that to allow a non-employee into the facility would essentially put at risk an environment where people are trusted and where he might see other information that is protected by law. I also recall that UIPA only mandates that the person named on a document is allowed to see it, and 338-18 doesn’t extend that to relatives. Sorry, can’t see any logical reason why Fuddy would bother to waste the state of HI’s time and money flying to GA, just to entertain frivolous foolishness. y_p_w: I’m wondering if Fuddy might just say to heck with this and just show up on her own (sans the requested materials of course). I’d be surprised if the judge would compel her to answer anything that is confidential and protected by Hawaii state law. I’d just like to see her on the stand telling about how many countless hours her office and the Attorney General’s office has wasted on Orly and other assorted birthers. 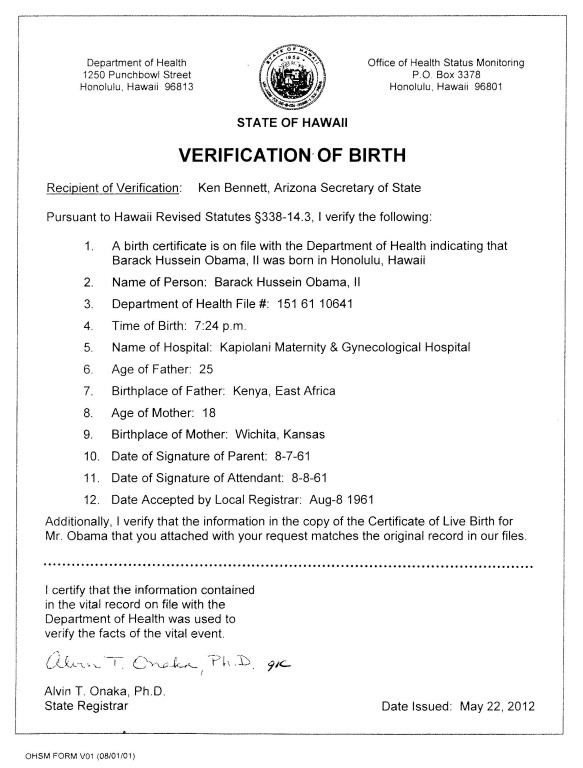 I wouldn’t mind seeing her on the stand just reiterating what we already know, which is that a bound copy exists with Obama’s original certificate, that she witnessed seeing the copies made, and that she fully believes that Obama was born in Hawaii. 99.44% likely that you are correct. But even folks that live in ‘paradise’ sometimes need to get out of town. Maybe she has always wanted to visit Epcot or Cape Canaveral and Atlanta is a major air hub isn’t it? WND is silent an lots of things that no longer serve their purposes, or were no longer defensible. Which is odd, they make stuff up all the time, so why not keep going? Where’s the “No Step” line on BS trail? Birfer slams into legally-relevant reality. Priceless. Birfer slams into legally-relevant reality.Priceless. Like many birther trolls on the intarwebs, I can imagine the witness arguing with the judge over the difference between fact and opinion. It would not end well for the idiotic birther bigot. If Orly’s New Hampshire antics have told us one thing, it’s that birthers usually become very monosyllabic if someone presses them on their “but but but” arguments. Just remember how she had to concede with a clear “no” when asked if any court has ever ruled on this issue. She didn’t even dare put up her usual “but they are all traitors” crap. The Magic M: If Orly’s New Hampshire antics have told us one thing, it’s that birthers usually become very monosyllabic if someone presses them on their “but but but” arguments. Just remember how she had to concede with a clear “no” when asked if any court has ever ruled on this issue. She didn’t even dare put up her usual “but they are all traitors” crap. 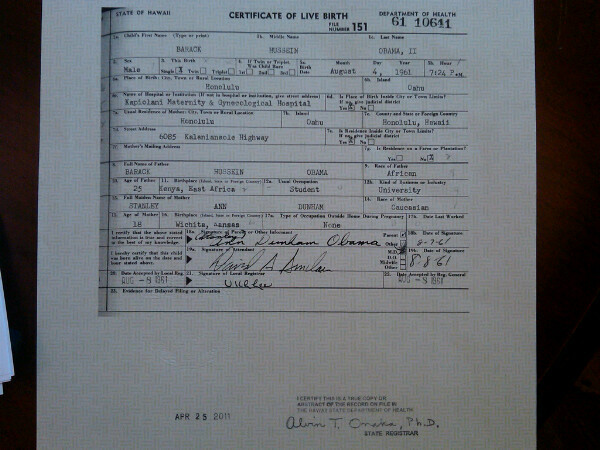 So I suppose a prominent birther, or one of their “experts”, in the witness stand would be quite humble and “sotto voce”. This is like watching a train wreck about to happen in slow motion. Another reason why the President will not show up. There are way more important things than BC and ballot challenges. If birthers are what I think they are, ST6 will become Obama’s assassins that will “snuff out” any opposition so he can become “King” of America. Though, I think only a few really nutty ones will try and run with it. y_p_w: As for the Atlanta CBS affiliate, exactly what would their news director know about a national program? If there’s anything that wasn’t shown, doesn’t Georgia have reporters’ shield laws? It sounds to me as if he was picked only because he had a Georgia address. My guess is she wants them to authenticate the video, so she could try to move it into evidence. Only problem with that, is everything in that video is inadmissable as hearsay (double hearsay if she’s trying to get the school records in). Funny that Orly rants and raves about pdfs of the birth certificate, which won’t be offered (if anything the real thing would, and is self authenticating), but doesn’t seem to understand that she just can’t grab handfulls of cr@p and toss it on the wall to see what sticks. JoZeppy: My guess is she wants them to authenticate the video, so she could try to move it into evidence.Only problem with that, is everything in that video is inadmissable as hearsay (double hearsay if she’s trying to get the school records in).Funny that Orly rants and raves about pdfs of the birth certificate, which won’t be offered (if anything the real thing would, and is self authenticating), but doesn’t seem to understand that she just can’t grab handfulls of cr@p and toss it on the wall to see what sticks. It’s a syndicated show (although produced by CBS), and no local news director has anything to do with it. If anything, some anonymous station employee simply grabs a feed and replays it. Again, I think the only reason she picked him is because it was less likely that the subpoena would be considered “improperly served”. Keith: 99.44% likely that you are correct. But even folks that live in paradise’ sometimes need to get out of town. Maybe she has always wanted to visit Epcot or Cape Canaveral and Atlanta is a major air hub isn’t it? They do mention that UIPA would apply to records of “those to which pertain” (or something like that). 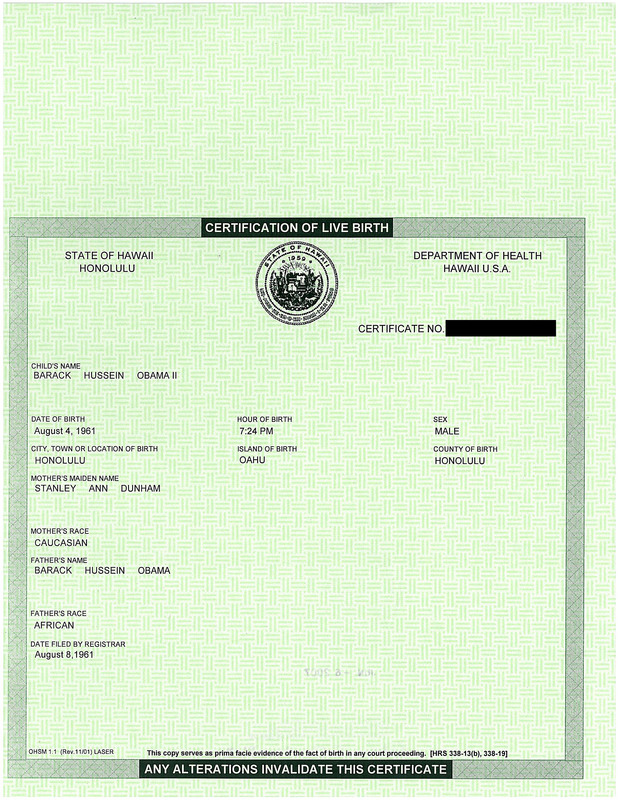 The meaning is that someone named on a particular birth certificate would be entitled to see the original, but that doesn’t extend to relatives or others listed in 338-18. They’re under no obligation to allow inspection, but that their statute limits the **possibility** of inspection (as well as certified copies) to a certain class. UIPA makes it explicit that it’s a class of one for certain original records, and Virginia Sunahara isn’t around to make that approval. It’s what we’ve known before – that Obama might be able to make a request to see it in person. I’m not sure how they would handle such a request, but it might be by taking the original to a room outside their secure areas, and having an employee stand watch to ensure that it’s not tampered or to ensure that no attempt is made to see other confidential records in the same volume. They’re certainly not going to allow someone from outside access to the area where they produce certified copies. Serious business is conducted at the Fulton County Superior Court complex. The disruption to litigants will genuine cases to be resolved is more than sufficient justification for revoking the invitation to use those facilities. Malihi opened Pandora’s Box. Let him be the one to host the pestilence in his office building. JoZeppy: but doesn’t seem to understand that she just can’t grab handfulls of cr@p and toss it on the wall to see what sticks. GeorgetownJD: Serious business is conducted at the Fulton County Superior Court complex. The disruption to litigants will genuine cases to be resolved is more than sufficient justification for revoking the invitation to use those facilities.Malihi opened Pandora’s Box. Let him be the one to host the pestilence in his office building. I won’t say exactly where I lived, but it was in California. I’ve received multiple jury summons and have been in the jury box three times (and dismissed by preemptory challenge once). I remember being in a former California District Court before they were merged into the Superior Court system. Some of the stuff I saw was pretty mundane. DWI misdemeanor trial. Residential burglary trial. Civil trial alleging improper prosecution. I’m not even sure it was necessarily doing the public’s legitimate business. Still – the defendants didn’t settle with the DA and the civil defendants didn’t settle with the plaintiffs. Still – some of the buildings were interesting. I spent 5 weeks in an older courthouse where there were no metal detectors. I’m guess they typically saved that for low-risk trials where they weren’t worried about gang members as spectators. I can’t count the number of people roaming the halls there who you’d think should be homeless if you saw them on the street. However, I guess everyone has the right to their day in court. I also saw some comment on The Fogbow that said that it’s practically law that there’s a coffee place near a courthouse. I’ve seen some in the basement of courthouses. One place near my county’s government buildings is called “Legal Grounds”. There’s also a McDonald’s across the street from the oldest courthouse. The area turns into a ghost town on weekends, and that McDonald’s isn’t even open. I was there a few weeks ago to get a vital record, and went to that McDonald’s again. It was an interesting mix of customers, including people who were obviously waiting to go to court, sheriff’s deputies, attorneys and county workers. It’s rather interesting how so many disparate types of people come together when the legal system is involved. I’m actually surprised at all the security that goes into some of these courtrooms. The federal courthouse in Yosemite National Park is about the size of a one bedroom house, yet has a jury box, a judge’s chamber, seating for about a dozen spectators, and a metal detector. I’m thinking the administrative hearing room is about that size. I know this is getting a bit off topic, but I am fascinated by some of the strange things that happen and people you meet when one is exposed to the legal system. this makes me wonder if the Judge knows he will shouted at as a traitor? Will he be surprized or wil he expect it? I just remembered that second challenge, I went to a downtown mall for lunch, I sat at a 6 person table as most seats were taken, the question I got was “do you know you sat at the same table as the prosecuter?” Mr Richie was gone. richCares: I just remembered that second challenge, I went to a downtown mall for lunch, I sat at a 6 person table as most seats were taken, the question I got was “do you know you sat at the same table as the prosecuter?” Mr Richie was gone. I was a college student the first time I served on a jury. I even missed a few classes as a result. When we talked to the attorneys after the trial was over, one of them said he could sense that the judge wanted to release me if I had just said something more about missing classes. I’ve been called 4 times. Only 3 of them did I even have to show up, as one was cancelled upfront. Of those other 3, I sat and watched the early process through jury selection, but none of them even got far enough in the call order for me to be questioned for jury selection consideration. So I’ve always been released. I’ve learned that in certain types of cases, just this process of initial case explanation and selection can take several days. Of those 3 situations in which I did have to attend, I was there for 1.5 days, 3 days and 3.5 days before jury selection completed and the rest of us were released. In California if you’re not called into the courtroom by the end of the first assigned day, you’re excused. They do have the right to issue a new summons at any time. Once you’re in the courtroom for jury selection, I think that means a one year excuse from having to show up for a jury summons. I also keep on getting a jury summons from outside my county, via a ZIP code quirk (where have I heard that one before) where the ZIP is shared between three places and even across county lines. I keep on sending it back with a note that I don’t live in their county, and the keep on coming. I even got a US District Court summons once. It was less than a year after I served on a superior court jury, so I was excused. Still – I hear that they’re more generous with jury pay. The county paid $5 a day and I didn’t get mileage because I didn’t live at least 25 miles from the courthouse. I thought that the Feds pay something like $50/day. Very interesting, isn’t it, that Jablonski steps over Malihi and attempts to strongarm Kemp. Now why on earth would such a maneuver be necessary, if in fact Mr. Obama could produce the requested evidence? What’s interesting is why you claimed here that Malcolm X was the President’s father and then days later changed it to mysteries from a Kenyan father. Keeping the idiotic innuendo straight must be frustrating, hard work. Saipan Annie: Now why on earth would such a maneuver be necessary, if in fact Mr. Obama could produce the requested evidence? So now what am I going to do on Thursday? Work . . . meh. For those who may not have checked recently, Reality Check moved his blog to http://rcradioblog.wordpress.com/. (fyi to those with blogs who have not changed their links yet). There is also nothing in your post worth paying attention to either. You are obviously just a delusional nut. The rest of your post isn’t even worth restating, because it is just a bunch of long debunked cr@p. You simply have nothing of value to say for any sane and rational person to pay attention to…sorry.